Two of the UK’s most respected architects, Eric Parry and Sir Richard MacCormac, won a resounding victory in last night’s debate for an outward-looking approach to Bath’s architectural heritage. In the debate, sponsored by The Holburne Museum, local architects argued that the World Heritage City’s future development should be left to local talent, saying that Bath needed: ‘time, understanding and humility’, as opposed to using outside starry ‘seagull architects’ who could fly in leaving behind a messy architectural trail. Aaron Evans, a local architect, used the example of Thermae Bath Spa where Grimshaw was commissioned for the project, but it worked because of the involvement of local conservation architect Peter Carey (Donald Insall Associates). At the end of the debate a show of hands revealed that over two thirds of the audience was in favour of Eric Parry’s position. Bath’s architectural heritage – Our future in whose hands? Sponsored by the Holburne Museum, BATH ARCHITECTURE 2008 is hosting a public debate at St Swithin’s Church, Bath at 6.30pm Monday 23 November. What promises to be an exciting and stimulating debate will look at our architectural heritage and question whether its future should be left in the hands of Bath architects. Speaking in support of local talent will be two of Bath’s most established architects, Aaron Evans and Edward Nash. Aaron Evans has practiced here for 30 years and has been responsible for the regeneration of Saw Close with the Seven Dials scheme and the Kingsmead Multiplex Cinema. 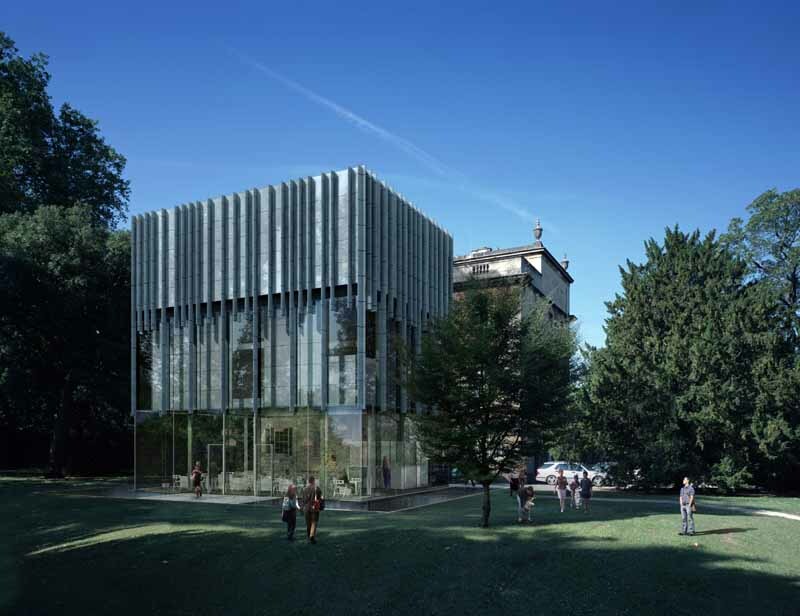 Aaron will be supported in the proposition by Edward Nash, a Bath Architect of 20 years standing who includes in his achievements The American Museum In Britain and the regeneration of the St Martin’s Hospital Site, both Bath projects. Arguing that Bath’s architectural future is best served by architects with an international reputation will be Eric Parry, architect of the Holburne Museum extension and recent winner of the Richard Feilden Architect of the year award for his work at St Martin-in-the-Fields and other projects. He will be supported by Sir Richard MacCormac, an internationally recognised past President of the Royal Institution of British Architects and with distinguished service as a Royal Fine Art Commissioner and, for the last several years, a member of the Bath Urban Regeneration Panel. The Holburne Museum, Great Pulteney Street, Bath is currently closed for a development project of restoration and extension supported by a grant from the Heritage Lottery Fund. When it re-opens in spring 2011 the Holburne will house a collection of fine and decorative arts, built around the art collection of Sir William Holburne – assembled in 19th century Bath. 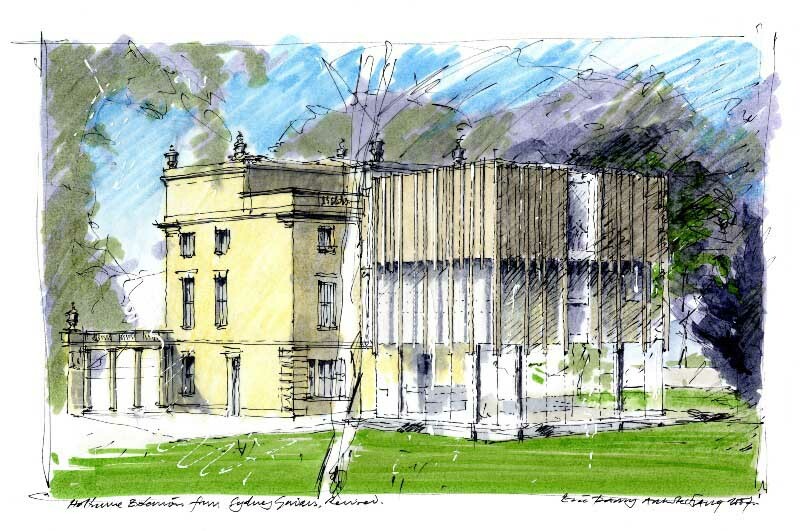 The Holburne Project will make us fully accessible to all visitors for the first time, allow more of the collection to be displayed than ever before, with an extension designed by Eric Parry Architects, and enable us to stage far more ambitious exhibitions, create a garden café and family friendly environment. – Bring together Architects and others interested in architecture, urban design and development in Bath and its surrounding. – Develop lines of communication with other organisations and groups in the built environment. Eric Parry RA | MA (Cantab), MA (RCA), AADipl, RIBA. Founder of Eric Parry Architects, Eric Parry studied architecture at the University of Newcastle (1970-1973), the Royal College of Art (1976-1978) and the Architectural Association (1979-1980). Eric Parry Architects was established in 1983, the year he was appointed as a lecturer in architecture at the University of Cambridge, where he taught until 1997. Significant early projects include an office building at Stockley Park, Foundress Court at Pembroke College, Damai Suria apartments in Kuala Lumpur and the urban interventions at London Bridge. The innovative 30 Finsbury Square won the practice much acclaim and was shortlisted for the Stirling Prize in 2003. The office building 5 Aldermanbury Square is now complete and was also shortlisted for the Stirling Prize this year. The Renewal Project at St Martin-in-the-Fields in Trafalgar Square has won many awards since its completion in 2008. Eric was elected Royal Academician in 2006 and is currently chair of the Architecture Committee. He was President of the Architectural Association in 2005-2007, and a council member from 1995. He served as Chair of the RIBA Awards Group and was a member of the Arts Council of England Visual Arts and Architecture Panel, and is a member of the Kettles Yard Committee in Cambridge. Eric serves as an External Examiner at schools of Architecture in the UK and has held lectureships at the University of Cambridge, Graduate School of Design, Harvard, USA and the Tokyo Institute of Technology. Richard MacCormac is chairman of MacCormac Jamieson Prichard, which was established in 1972 and incorporated in 2002. Richard has taught and lectured widely, and published articles on urban design and architectural theory. He is regularly invited to be an assessor of architectural competitions and design awards. He is a Fellow of the Royal Society of Arts and a Royal Academician. Richard has served two terms as a member of the Royal Fine Art Commission and has been a past commissioner for English Heritage. He served as President of the Royal Institute of British Architects from 1991 to 1993. In 1994, Richard was awarded a CBE, and received a knighthood in 2001. He was chairman of the Royal Academy Architecture Committee and chairs the Royal Academy Forum. Richard is also a trustee of the Sir John Soane’s Museum. Notable building projects include: Cable & Wireless College, Coventry (RFAC/Sunday Times Building of the Year Award 1994); Garden Quadrangle, St John’s College, Oxford (Independent on Sunday Building of the Year Award 1994); Bowra Building, Wadham College, Oxford; Burrell’s Fields. Trinity College, Cambridge (RIBA Regional Award 1997, Civic Trust Award 1997, and Brick Award, Supreme Winner 1996), and the Ruskin Library, Lancaster University (Independent on Sunday Building of the Year Award 1996; RFAC/BSkyB Building of the Year, Universities Winner 1998; and Millennium Products status awarded by the Design Council 1999); the Wellcome Wing at the Science Museum (Celebrating Construction Achievement, Regional Award for Greater London 2000); and Southwark Station, Jubilee Line Extension (Millennium Building of the Year Award, RFAC Trust/BSkyB 2000). Current master-planning projects include the expansion of Cambridge University into West Cambridge and the Phoenix Initiative, a regeneration project for Coventry. Other current projects include Building 1 in Paternoster Square adjacent to St Paul’s Cathedral and the redevelopment/refurbishment of the BBC at Portland Place. Exhibition design includes Ruskin, Turner and the Pre-Raphaelites at Tate Britain, spring 2000 and Surrealism – Desire Unbound shown at Tate Modern, end 2001. Richard is currently on Bath & North East Somerset’s Urban Regeneration Panel. This panel was set up to guide and challenge the proposals for the future development of the city. Aaron Evans has established and maintained his practice in Bath since 1978, and also has a long track record in education, both as a lecturer and as a Part III RIBA examiner. He has been an active member of RIBA, as well as local architectural groups. Aaron is an RIBA Client Design Advisor, has specialist experience in Townscape Assessment Studies, Master-planning and Conceptual Design studies and as a Conservation Area advisor. He has also acted as an expert witness at Appeals and Public Enquiries. Edward was born in 1952 and completed his training as an Architect at the Royal West of England Academy in Bristol between 1971 and 1975. His early working experience began in the office of Sir Geoffrey Jellicoe’s Landscape Practice in the Cotswolds, in rural practice in Gloucestershire and as an Associate with two Bristol-based practices dealing principally with Conservation and Urban Design. His previous experience also included two positions as a Conservation Officer with planning authorities in Worcestershire and Avon. Edward now oversees the practice and is frequently consulted for Project Management advice and Conservation Planning on a consultancy basis, and acts as an Expert Witness in Conservation Planning matters. Recently such work has included commissions for NHS Estates in Somerset and Kent, for BT in the expansion of the Dockland’s Light Railway, for J Sainsbury and Cultural Heritage and Economic Regeneration. Many of his projects require a high involvement in promoting ideas to the wider community, liaising with community groups, users, property owners and neighbours to develop schemes that can meet the expectations of all whilst remaining commercially viable for our clients and attracting external investment through heritage and cultural awareness. Edward joined the Register of Accredited Architects in Building Conservation in 2004 and has also recently been asked to serve on the board of INTBAU, the International Network for Traditional Building, Architecture and Urbanism. In 2008 he was appointed to serve on English Partnership’s (now HCA) South West Design Review Panel.